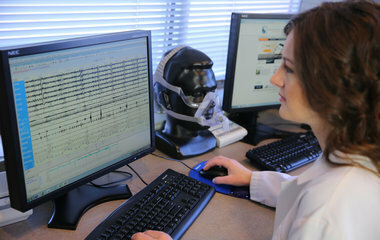 The American Board of Sleep Medicine (ABSM) is now offering the option for candidates to earn the Registered Sleep Technologist (RST) credential by taking the Sleep Technologist Registry Examination as an online proctored test. Candidates will now have the option of taking the exam in a Kryterion testing center or as an online proctored exam at home or the office. The online examination is administered with the use of a webcam and computer. It is delivered to the computer and then visually and audibly monitored by a Kryterion Certified Online Proctor. To be eligible to take the examination online, applicants must meet specific hardware and software requirements. Please visit the Kryterion website for technical requirements or to test your equipment. Please visit the ABSM website for more information or to download the candidate handbook and application. Sleep technologists also can benefit from the professional development resources available from the AASM by becoming a Sleep Team Member. Discounted membership pricing is available to sleep technologists who are employed by an AASM-Accredited Facility Member. Learn more about an AASM individual membership.